Being released to fight alongside the Gipsy Avenger is another hero in the Jaeger fleet, Bracer Phoenix! Making its debut for the first time in the High Grade series, Bracer Phoenix features multiple points of articulation and weapon parts! Bracer Phoenix's Vortex cannon can be recreated to show off her firing mode! Alternate parts are included in this set and feature interchangeable chest pieces to build out the Vortex Cannon. 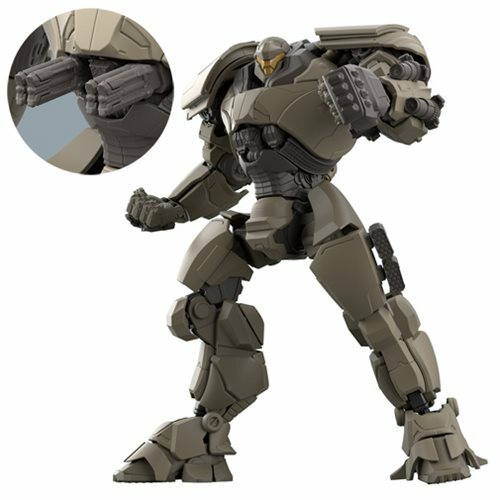 The Pacific Rim Uprising Bracer Phoenix High Grade Model Kit includes 1x Vortex Cannon firing mode recreation parts, 1x Scrapper, 4x Runner, 1x Marking sticker sheet, 1x Foil sticker sheet, and 1x Instruction manual. Measures about 6-inches tall. Ages 15 and up. Penny Dreadful Frankenstein 6-Inch Figure - Convention Excl.